Laurie Allen has done it again! 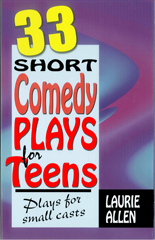 Due to popular demand, she has created another book of short plays for teens, all fresh and original. Thanks to the natural dialogue and believable situations for both inexperienced and veteran performers, teens love the real-life dilemmas in these comedies. With cast sizes ranging from two to seven, most running times between five and ten minutes, and only the simplest of props required, these modern-day complete skits are ideal for classroom practice or to build an evening of entertainment. Titles include: Crazy Hair Day, Flavor of the Week, Juliet Tryouts, Tornado Drill, and Chatterbox. People just can’t get enough of Laurie Allen’s comedy duet scenes!